Starting tonight the St. Louis Cardinals host the Cincinnati Reds in a three-game series. The Reds enter the series with Jim Riggelman as their new manager after firing Bryan Price on yesterday. The decision was taken after the Reds lost 10 0f their last 11 and started the season 3-15. The Cardinals are returning to Busch Stadium after embarking on a seven-game road trip to visit the Reds and Cubs, but Chicago’s weather only allowed them to play two of the scheduled three matches. The Cards went 5-1 on the trip and now look forward to sweeping the Reds at home after doing the same in Cincinnati. April 20 – 7:15 p.m. 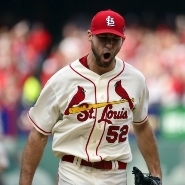 Note: In his last 10 starts against the Reds, Wacha is 8-0 with a 2.43 ERA. Finnegan lasted just 4 1⁄3 innings against the Cardinals on April 14 as he surrendered five runs on six hits while walking and striking out four batters. April 21 – 1:15 p.m. Note: Martinez leads the National League Central division in strikeouts with 30. Bailey has a 2.77 ERA in 13 innings with 11 strikeouts and two walks in his last two starts. April 22 – 12:10 p.m. Note: On his last start Mikolas pitched seven innings, struck out four and allowed just one run. In his last start, Castillo pitched 6.2 innings, striking out eight batters and allowing four runs for a win against the Milwaukee Brewers.